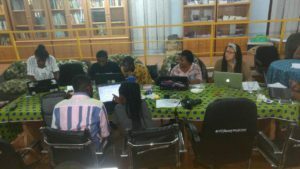 On the 4th of March 2017, the Wiki Loves Women Ghana Team held a satellite node of the Arts and Feminism Edit-a-thon in Accra. Arts and Feminism is a international campaign within the Wikimedia movement aimed at promoting contents around Women in the Arts and Feminism across the globe. This year’s intervention saw over 2500 people attending over 200 satellite events across the globe with over 6000 new pages created. 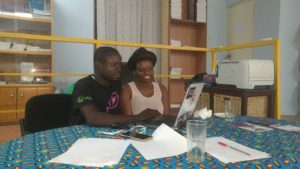 The Arts and Feminism and Wiki Loves Women event was hosted at the Resource Center of the African Women’s Development Foundation (AWDF). AWDF is a grant making foundation that supports local, national and regional women’s organizations working towards the empowerment of African women and the promotion and realization of their rights. It is the first pan-African foundation to support the work of women’s rights organisations in Africa. Established in 2011 and headquartered in Accra Ghana it is operational in over 42 countries. AWDF is both a network and content partner for the Wiki Loves Women intervention in Ghana. The event was attended by volunteers from the Wikimedia Community in Ghana and some people keen in improving contents around women.